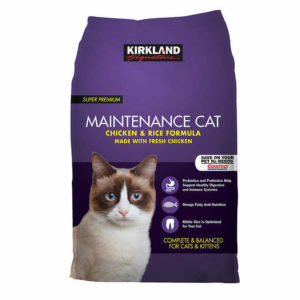 Kirkland Signature Super Premium Healthy Weight Indoor Adult Cat Formula is specially designed to be nutritionally balanced to help indoor adult cats achieve and maintain a lean body condition. 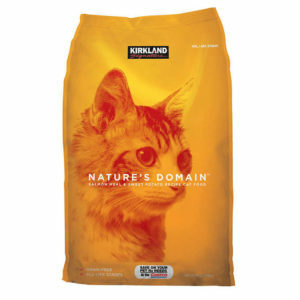 A blend of fiber ingredients helps support healthy digestion and the added health benefits of omega fatty acids, antioxidants and L-Carnitine will help your cat lead a happy, healthy life. Digestive Support System: Probiotics and natural prebiotic fiber from dried chicory root help maintain the proper balance of beneficial bacteria in your cat’s intestines. These probiotics are processed under strict human-grade standards to ensure purity and viability. Each kilogram of food provides 220 million live, active cultures that help support healthy digestion and help your cat maintain an active lifestyle. 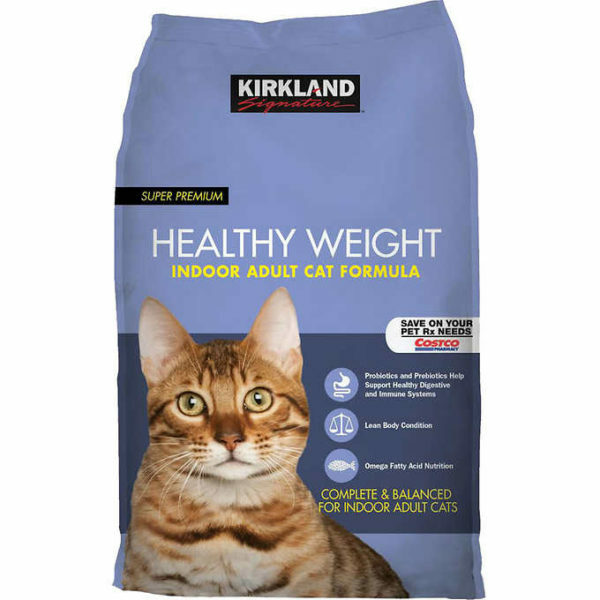 Lean Body Condition: With only 285 calories per cup and added L-Carnitine, this formula is designed to help overweight cats lose weight. L-Carnitine helps turn fat into energy and build lean muscle. Antioxidants: Guaranteed levels of vitamin E and selenium work together to support your cat’s healthy lifestyle. Added Taurine: An essential amino acid for your cat’s heart and eyes. When fed properly, helps cats return to their optimal weight range within 6 weeks. Strategically formulated for hairball control. No corn, wheat or soy ingredients. Changing your pet’s diet should be a gradual process. Start by adding a small amount of your pet’s new food to their current food, gradually increasing the new food amount and decreasing the current food amount at each feeding. Continue this method for approximately one week. For sensitive cats, a more gradual change is beneficial, over a period of 10 to 14 days. Chicken meal, ground white rice, peas, powdered cellulose (source of fiber), potato protein, chicken fat (preserved with mixed tocopherols), natural flavor, flaxseed, fish meal, sodium bisulfate, potassium chloride, choline chloride, DL-methionine, taurine, dried chicory root, L-Carnitine, Lactobacillus acidophilus, Bifidobacterium lactis, zinc proteinate, vitamin E supplement, niacin, manganese proteinate, copper proteinate, zinc sulfate, manganese sulfate, copper sulfate, thiamine mononitrate (vitamin B1), vitamin A supplement, biotin, potassium iodide, calcium pantothenate, riboflavin (vitamin B2), pyridoxine hydrochloride (vitamin B6), vitamin B12 supplement, manganous oxide, sodium selenite, vitamin D supplement, folic acid.